A machine that is used for cutting wood, metal, plastic and a variety of materials into straight, curved or irregular shapes is called a horizontal bandsaw. 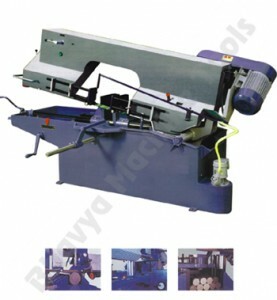 A wide range of bandsaw equipments are available in the market. They are made from cast iron, steel or aluminum alloy. The blade consists of a continuous band of metal which has teeth on one edge. These teeth are used to cut different pieces of work. The blade of the machine is held either by guide blocks or bearings. The saw blade is secured between two wheels or pulleys. One of the wheels called the driven wheel is fixed in place and it provides the power to the saw. The other wheel is the idler wheel which is used to make the blade in the saw tight or loose. A horizontal bandsaw machine is a versatile power tool and a foundational tool in many workshops. The work piece is clamped in place and then the blade slides down through the work piece and cuts it. A sprayer and a pump keep the work piece covered in a cutting fluid so the metal does not overhead and it can be cut easily. These are usually used for cutting the supply down to size. The exact finishing cuts are made on more precise equipment. Perfect cuts save a lot of time and stock removal cutting is made much faster. The horizontal bandsaw device is normally used to cut large pieces of work, wood or metal, and different blades make different cuts. They have higher cutting speed and better accuracy. These are very suitable for cutting long bars into different shapes. Designed for smooth and vibration free functioning, the economical and low noise tools offer maximum output and minimum wastage. 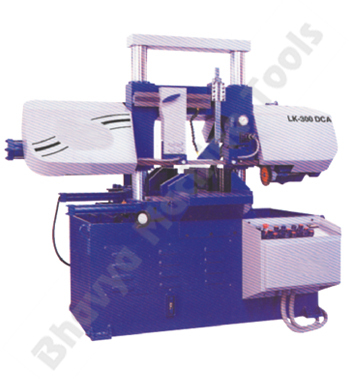 The horizontal bandsaw machines are extensively used in automobile, electronic, electrical, wood working etc. Different types of blades are used for different materials. A diamond blade is used to cut glass, a segmented cold saw blade is used to cut structural tube, and a fabrication blade is used for aluminum, brass or copper. To cut steel tubes, angel cuts and decking, friction & hot saw blades are used. Ferrous applications, cutting extrusions, thin wall tubing, bar stock, angel iron and flat bars are cut with solid high speed steel saw blades. Circular knives are used to cut rubber, fiber glass and aluminum. Carbide tipped saw blades are used to cut aluminum, brass, copper and bronze. Sparks fly during cutting so protect your eyes and face by wearing a facial safety guard or safety goggles. As soon as cutting work is over remove the blade from the saw and store it in a place where it will not get damaged or scratched. Thus, while selecting a horizontal bandsaw machine, choose unit which gives superior accuracy and which is suitable for cutting long bars in different shapes. The model chosen must suite your requirements. These machines have really simplified and secured the production work, and has also allowed advanced productions at minimum energy consumption rates. This entry was posted in Bandsaw Machine, Horizontal Bandsaw Machine, Machine Tools by Yash Shah. Bookmark the permalink.